On the 14th March 1969, Nixon announced another change in the deployment of the ABM system which was called Safeguard. This consisted of 12 installations, as show in the following figure, of both Spartan and Sprint missiles and provided a limited defence against incoming ballistic missiles and fractional-orbit bombardment missiles (FOBS). Even this reduced ABM system meet stiff political opposition with the US congress approving it by only the deciding vote of Vice-President Spiro Agnew on 6 August 1969. This initial Phase I deployment consisted of two sites for the protection of the Minutemen ICBM missiles. The sites selected for this first phase were Malmstrom AFB in Montana and Grand Forks AFB in North Dakota. Phase II deployment consisted of construction of a Safeguard site at Whiteman AFB Missouri, and for advanced construction works at Warren AFB Wyoming. This Phase II, which also consisted of missile inventories for the Phase I sites, was approved in December 1970. However, advanced preparation for another four sites was not approved. In November 1971, funding was provided for system studies for the installation of a site to protect Washington DC so that the National Command Authority could be protected. Beyond these studies, no further work was ever done for a site to protect the US national capital. It was early in the 1970s that diplomatic efforts between the USA and the Soviet Union started to pave the way for limited disarmament and arms control. The first of these was the SALT I agreement which limited each country to two 100 ABM missile sites. As a result, in May 1972 all construction work at Montana was suspended as it was some 19 months behind the construction work at Grand Forks. The SALT agreement was further amended on 3 July 1974 to a single ABM site which could either protect the nations capital or an ICBM site. The installation at Grand Forks reached initial operational condition in April 1975 with 28 Sprint and 8 Spartan missiles. It was declared fully operational on 1 October 1975 with 70 Sprint and 30 Spartan missiles. On 2 October 1975, the US Congress voted to shut down the system. A final bill was passed in November 1975 that allowed the PAR to continue to function, but the MSR was to be turned off, and the missiles disarmed and removed. Starting in February 1976, the US Army shut down the MSR and started to remove the warheads from the missiles as well as removing the missiles from their launching cells. The site had barely operated for 5 months. It seems strange that the US Congress voted to shut the system down after it had been operational for barely 24 hours. The were many reasons why it was done. Many were political, and some were technological. It had been known for many years, that the system could be overwhelmed by the Soviets if they used multiple warheads on their missiles - the Soviets were arming their missiles with MIRVs. It was also felt that the huge radars were very vulnerable to attack and represented a critical failure point of the system, even though they had been designed with highly redundant systems and hardened against nuclear attack. Although these were well known problems with the Safeguard system, and all other systems before that, Congress just lost the ability to continue to support it. The Grand Forks installation was known as the Stanley R. Mickelson complex and was located approximately 160km (100 miles) northwest of Grand Forks. It was designed to protect the 150 Minuteman missiles located in that area as well as provide some defence to the civilian population of that area. Only one PAR was constructed and was located near Cavalier in North Dakota some 40km (25 miles) north east of the missile site, while the MSR was located near the town of Nekoma, North Dakota. 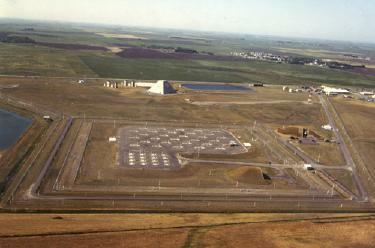 Testing of the PAR at North Dakota began in August 1972 with it successfully tracking a satellite some 12 months later. It was not until another year later that the PAR Operational Acceptance test had been completed. Meanwhile the MSR started its tests in January 1973 with it successfully tracking a satellite in December of that year. Autonomous tests of the MSR were completed in June 1974 which when combined with the PAR tests permitted the entire installation to be handed over to the US Army in October 1974 on schedule. An active program during 1969 until 1972 was called Safesam which involved combining Safeguard sites and SAM-D (which later became Patriot) together to protect American cities. Another program which involved a bit more money was the Site Defence of Minuteman (SDM). This was basically the Sprint II missile program and was active during 1971-1974. SDM was developed into the Low Altitude Defence (LoAD) in 1979 for the protection of the MX missile. LoADS then became the Sentry system in June 1982. It was during 1983 that the connection to the nuclear ABM missiles was finally broken as a non-nuclear ABM system became more important in the area of politics and the Department of Defence.